It's an unpleasant surprise because I got a project next week and I cannot automatically load my compositions in full screen mode. Could you tell me why it's disabled? Re: "Full Screen on Start Up" in KinemeCore 0.5.2 is disabled!!! Well, thanks for sharing that work around, voxdeserti. I guess this is one for the Kineme crew to look at and to sort out; it all relates to getting that enhancement to work neatly with the Lion Full Screen mode. Until then Command + F is the only close approximation to getting any Full Screen facility and of course, it isn't automatically available. Which then leads on to http://kineme.net/composition/dust/AppleScriptPlugin contributed by dust; I think you'll need the http://kineme.net/files/a.s.k.not_.safe_.zip which will be good for using with QC only. Not sure if it will work in Lion.There is another version posted on that thread by dust for use in non Kineme Core environments. Both would probably need a Lion specific or compatible rebuild. There is also the option of installing FXFactory so you can use the free of charge plugins which also includes an NI AppleScript plugin which you could use for such a purpose. That said, I think to gain that kind of facility you want you'll need to be turning on Accessibility features - register with this forum http://macscripter.net/index.php and you should find something therein that will help you out to achieve your desired objective. You could also give yourself some help by following this thread - http://kineme.net/forum/General/kinemecore which addresses precisely the same issue you've stumbled up on. I agree that there didn't seem to be a reason to remove that feature, at least when lion was released (maybe it broke since). There were a few thing that broke, but that wasn't one of them, at least when I tested it out. I think once you go fullscreen in OS X, if you quit while fullscreen, it opens back fullscreen. You're right about the preferences sticking,in so far as the Viewer window will open full screen with the toolbar, but if you want to go full screen presentation without a toolbar, then it is Command + F. Just checked that out. Which I guess means that one has to use the scripting plugins available and that Universal Access will have to come into play. What is it that one would script/what would the need be to do that, if it will always reopen fullscreen, or you can check off the option in the k-core plist manually? (I know I'm missing something here, as I type this to you using SL). Yes, Cybero! I actually wanted to start QC comp in fullscreen mode on Mac OSX 10.6.8 boot, and for starting composition I use applescript but I cannot find an appropriate applescript command in applescript editor of Mac OSX to make QC's viewer to go fullscreen. And I'm not also sure whether such command is available! I have booted into the same version of OS X to verify that my approach will work for you. 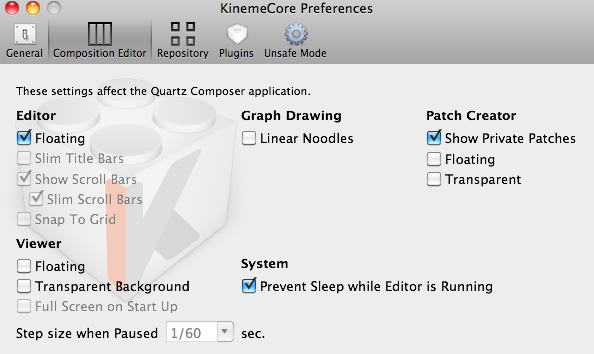 Regards your comment about Apple Script, Quartz Composer is not Apple Scriptable. It does not contain a Dictionary Suite for the Apple Script Editor to work with. You could turn on Universal Access in System Preferences and use Automator though. You'll have to create a set of Automator actions for each of your compositions though as far as I can tell. You can also create an Automator application[s] for the workflow[s] that you create. Just drop the workflow into the Automator Application. This isn't an ideal solution I guess, but it works, albeit slowly until the Viewer is running. Apart from that you could create a Cocoa application with a QC View in the main window and then use Apple Script to 'tell' that application to go full screen,which is going to be about as quick as running the Automator workflow from Automator or running the Automator application or, you could build your application into a Quartz Builder application and run that full screen. Please find attached the example Automator working proof of concept, works under Kineme Core .5.1 and .5.2 with the little QC composition that they call upon. Haven't tried this out in Lion as yet, so will boot into that distro soon as I can to try out this solution of sorts. This solution has by now been tried in Lion, it doesn't work there, OS differentiations come into play. Still you are on 10.6.8 so that doesn't make any difference to you, does it really?